With Christmas at the door, we all rush deciding who we want to be this year: a cutie princess, a glam chick or a modest business lady, who just can’t have enough of elegance? Makeup and hairstyle tutorials come as real rectifiers to all your style dilemmas to this end, offering endless inspiration and always-fresh creative ideas for being unique any time. This Christmas be the modern fashionista, who shines like a true star with her glittery gold makeup and makes a strong sartorial statement with a modern chic updo that rocks! Take a look at this Christmas beauty tutorial and prep your hair and face for the party! 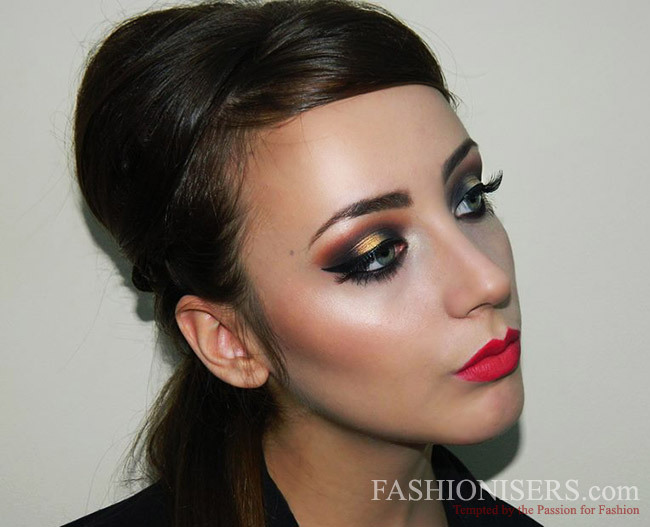 Follow the steps to recreate this fascinating makeup style in an instance! Step 1: For the most successful party makeup, pay special attention to the base! Camouflage any skin imperfections using a concealer, apply a makeup base and then the foundation, preferably with a makeup brush for the most flawless result. Sculpt your face with your fave blush tone and a bronzer, if needed. Step 2: Contour your eyebrows using the most matching brow kit for you, taking into account your natural brow color. Step 3: Start your glitzy eye makeup by applying an eye primer and a base. Apply a matte black eyeshadow to the inner and outer corners of your lid, leaving the middle part clean. 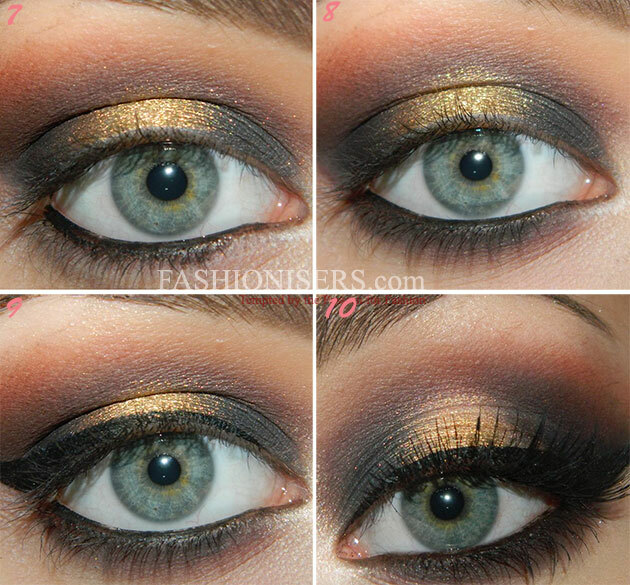 Blend the black eyeshadow using a matte dark brown shade. Use the brown above the middle of your eye too. Next, continue blending the colors higher to the crease with a warm matte brown eyeshadow. Finally, fill in the middle clean part of your lid with a true gold loose pigment (you can apply the shade with your finger). Step 4: Apply black eyeliner to your waterline and blend it in to your lash line. 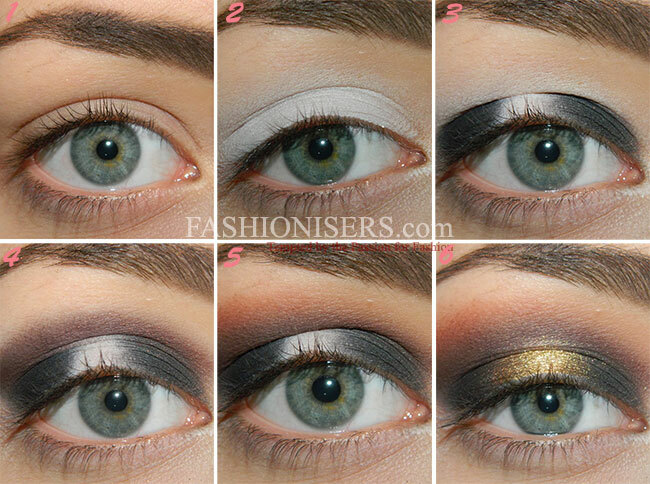 To the lower lid apply the same matte black eyeshadow you used before and continue blending it with a dark brown shade. Step 5: Apply black liquid eyeliner on your upper lid. Now, highlight the inner corner of the eye and your brow bone. Step 6: Apply black mascara and false eyelashes for maximum impact! Step 7: Finish off your Christmas makeup with a red lipstick. As you are done with your holiday makeup, it’s high time to style your hair into a chic updo. Follow the step-by-step hairstyle tutorial below for a dazzling look! Step 1: Comb your clean hair and separate the top part. Start teasing this part of hair. 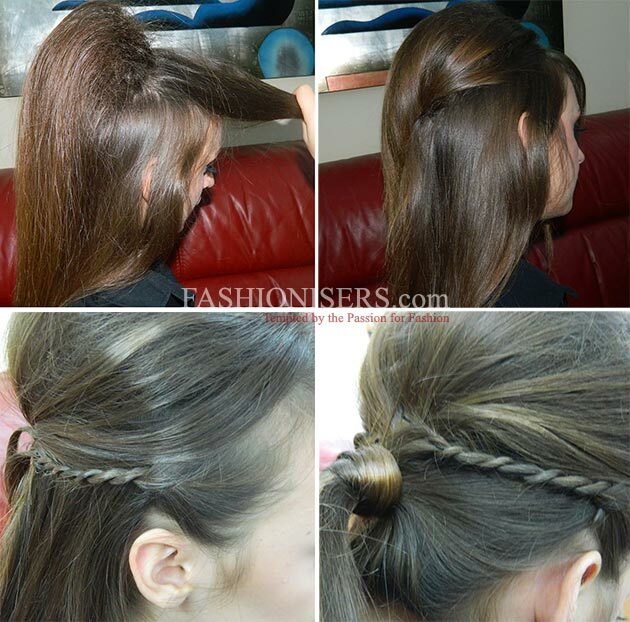 Section small strips of hair, apply a hair spray and then pull the hair from the top to the roots using a comb. Repeat the same action to the rest of the hair, leaving only a small section of hair out that will be used for covering the teased hair and the forehead. Step 2: Arrange the hair on the forehead and pin it in place behind the ear. As you have completely covered the teased hair, pin it in place in the back. No need to create a very sleek, polished look for this. Step 3: Rope braid the side sections of the hair in 2 or 3 braids and pin them in the back. Pull the rest of the hair into a ponytail and secure it with an elastic band, which you’ll need to cover with a piece of hair taken from the tail. Your show-stopping holiday hair and makeup are ready! It’s high time to hit the party and enjoy everyone’s great compliments!